In the end, you get from Bose what you almost always get from Bose: A minimal, stylish speaker that sounds really good. Would be great to have smart assistant capabilities. The Bluetooth speaker market has changed a lot in the years since the likes of the Jawbone Jambox kickstarted a new movement in loud, room-filling, portable speakers. Now more traditional audio companies are dominating, by pushing the design and audio envelopes year on year. For Bose, the SoundLink name has become synonymous with good quality, small, but loud speakers. And in the SoundLink Revolve it has a truly portable, 360-degree sound-output portable that's worthy of your aural attention. As you can probably imagine from the name, the Revolve is the round model in the SoundLink series. And it's not just designed that way for aesthetic reasons: Bose promises 360-degree audio from this bottle-shaped speaker. The aluminium-clad exterior is perforated with tiny, individually machined holes all around the circumference on the bottom half. The choice of anodised aluminium and tapered sides certainly adds that premium, understated feel, just you'd expect from Bose. There is one small "notch" on the back that isn't covered in holes, which is where you'll find the Micro-USB and 3.5mm jack ports. While it's designed to be portable and wire-free, these ports ensure you can still charge the internal battery, and hook up an audio source the old-fashioned way with a cable. If you want to do without the necessity of plugging in a Micro-USB cable to charge, Bose offers an optional charging base that refills the in-built battery using the contact points built into its base. Just plonk it down, and it starts charging. These gold contact points are joined by a universal thread mount, which will allow you to screw it onto a tripod - if you feel the need. To ensure the speaker stays still, the base is surrounded by a grippy rubber ring. Similarly, the top of the unit is covered in a silicone that reaches around the edges, providing a slim lip that isn't substantial, but stops the speaker slipping out of your hand when you pick it up. Even if it does slip, or fall off your shelf/coffee table, it's built to withstand the drop. It's to the top you'll also find all the physical controls. All six buttons are slightly recessed dimples, offering control for all the usual elements you'd expect to find. There's volume up and down, Bluetooth pairing, power, input source switch, and a multi-function button that you can use for activating Siri or Google Assistant on your phone. As a little bonus, the SoundLink Revolve is water resistant, but not to the extent that you can dunk it in a pool. However, it should survive splashes pool-side, or near the kitchen sink. On the whole, the SoundLink Revolve is attractive without looking obnoxious. I'll comfortably hide away on a shelf, or sit on a coffee table without feeling the need to shout about itself. It's a speaker with self-confidence in its own minimalism; not a loud, bright orange shouty thing full of neon lights. Good sound quality from a Bose product is almost taken as a given. If there's a Bose logo on it, it'll be well balanced and easy listening. And that's what you get from the SoundLink Resolve most of the time. The intriguing feature here is that the sound is projected out of the entire circumference of the speaker using an interesting driver/deflector. 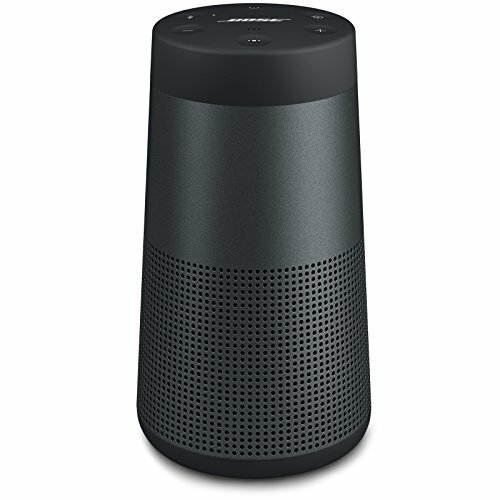 Rather than go down the route of having multiple little speakers all pointing in different directions, the Bose has one main speaker. This points downwards towards a deflector which then bounces the sound outwards in all directions. This means it doesn't matter where you are in relation to the SoundLink Revolve. You could be standing behind it, in front of it or off to the sides, and it'll sound the same. Combining with that, and to help resonate those low notes and reduce vibration, there are a couple of passive radiators. All this means you end up with a speaker that's capable of filling most rooms with sound. Plus, it's surprisingly well balanced for such a small device. Of course, as with any speaker, how good it sounds depends on what you put the speaker down on, as well as the sound and makeup of the room it's in. Place it on a solid granite surface in your kitchen, and the high-frequency or treble elements get accentuated, almost to the point of being a little too harsh in some songs. Plonk it down on a nice solid wooden shelf and you get a more balanced, restrained, yet warm tone. We'd like there to be a little more bass than there is, but overall the low frequency comes through clear and controlled, without muddying the mix. Scale is part of the reason it's not the bassiest of products out there - similar competitors, such as the UE Megaboom also can't hit the lowest of low-end. Volume from the SoundLink Revolve is decent too. Despite the speaker being the size of a small water bottle, it can fill an average sized lounge with ease. Even larger open-plan rooms don't swallow up the sound, although we feel the bigger Revolve+ would be a better option here. Like most of Bose's most recent products, you can control many of the speaker's features through the Bose Connect app. You can use it to adjust the volume and manage which devices it's connected to, as well as start "Party Mode" (Bose's name for being able to connect a second SoundLink speaker and have a form of wireless stereo). Sadly, while you can adjust volume, you still can't adjust the EQ to suit your own preferences, so you're stuck with what the audio company thinks is the right sound. In many ways, it's just as easy to control the speaker using the buttons built into the product itself. There's no confusing procedure where you need to long-press or double-click buttons to get it paired or switched. Press the power button to turn it on, press the Bluetooth button to get it in pairing mode. There's a computerised voice that tells you when a device is connected, and informs you of the battery level every time you power it on. Once it's playing, you get 12 hours of battery before you need to plug it in again. At least, according to Bose's claims. In use, the reality isn't far off that promise. After somewhere between two-three hours of music, the speaker was down to 80 per cent. Perhaps the one feature missing off the list is a built-in smart assistant. Google and Amazon have both seen several new audio products built with Google Assistant or Alexa incorporated. This includes the second-generation Bose QC35 on-ear headphones. A Bose-built competitor to Google Home would be great. The SoundLink Revolve provides what you almost always get from Bose: a minimal, stylish speaker that sounds really good. While there are plenty of great-sounding Bluetooth speakers out there, it's nice to have one that doesn't have an attention-seeking design, or painted in some migraine-inducing colour scheme. While it would be nice to have a smart assistant built-in, the SoundLink Revolve still gets all the basics right. It'll last playing music all day on a single charge, it looks good, is easy to use, portable, and built to last. Another 360-degree output, bottle-sized speaker with plenty to shout about. The styling of the UE is more distinct than the Bose, especially in the material covering. It sounds great and, also like the Bose, is weather-sealed. Plus you can sync multiple UE products together for enhanced/stereo output.